Lake Bayano was created from the Rio Bayano and its tributaries following the construction of a dam and hydroelectric plant that today supplies Panama City and other areas with their electricity. The lake is divided into three large inter-connected portions for a total of 135 square miles (350 square kilometers). 80% of the lakefront is within the Comarca de Madungandi, populated by the indigenous Guna, Emberá, and Wounan Amerindian peoples. Although most of the lake lies within the Comarca, travel anywhere on the lake itself is free to all who wish to visit. Lake Bayano is the Jewel of Panama with a spectacular environment that is home to hundreds of birds and other animal species, some of them very rare. Chief among its many splendors are the Panama Caves of Lake Bayano. The caves were formed over many centuries by an underground river that continues to flow today. Fortunately for all of us, the caves are easily entered and enjoyed by foot year-round, and partially by boat during the rainy season. 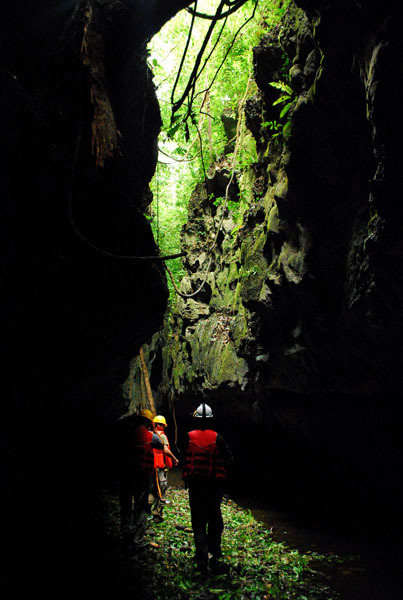 Our cave adventure tours are provided by Bayano Adventures S.A., a company owned and operated by a Panamanian family with three decades of experience at the Lake as dairymen. They also own and operate a tourist center, Bayano Adventures, from where all cave journeys begin. We are the only tour operator to provide a permanent facility on the lake for the comfort and convenience of tourists. The center also provides activities, including lake kayaking, hiking trails, horseback riding, camping facilities and other activities enjoyed by visitors. Join us on a trip to the caves of Lake Bayano! Call or write us and we will help you arrange the trip of a lifetime!